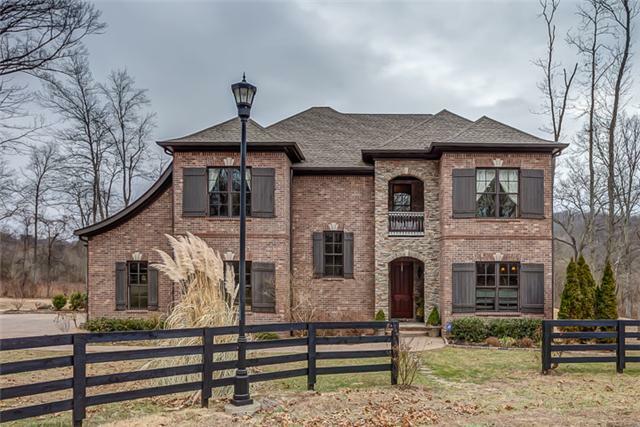 Traditional style highlighted by spaciousness and fine appointments best describe this luxurious property in Belle Chase Farms, located in Franklin. Situated on more than two private acres, 3210 Chase Point Drive offers panoramic views of the beautiful rolling Tennessee hills, and is surrounded by serene, wide open space, dotted with large, mature trees. Privacy abounds on the interior too, with plenty of space for the entire family. Four bedrooms and five baths span 5,082 feet on two generous floors including a three-car garage. Listed at $999,995 this elegant abode has everything your family could want, and more. Youell notice wonderful features here you canet find just anywhere. That includes wide-planked hardwood flooring throughout the first level; spectacular chandeliers; pristine moldings; fine, stained interior doors; oversized room openings; iron stairway balusters and three fireplaces. The unique and functional floorplan is highlighted by plenty of windows allowing for an abundance of natural light, along with a seamless flow. With an open concept kitchen and family room, the family chef will cook in style while still being connected to all of the household activity. This eat-in kitchen is an entertaineres dream come true, featuring classic light cabinetry and tile, polished granite and lots of counter space including a large center island with a savvy contrasting paint color. Also included are double ovens, a walk-in pantry, stainless steel appliances and an efficient gas cooktop. The attached family room is centered around a cozy flagstone fireplace and wonderful built-in bookshelves. Both rooms overlook the large deck and superb covered back porch — a perfect space in which to enjoy the upcoming days of spring and summer. Breath-taking best describes the home office, which looks like it was plucked right out of a magazine. Wonderful, caramel-stained wood paneling surrounds the room and depicts warmth, sophistication and style. A stunning fireplace in the center is flanked by built-ins and cabinetry, while a double-hung window provides soft, natural light with glimpses of the expansive property beyond. Also located on the first level is a large and relaxing master retreat, with a stunning trey ceiling and a wall of windows and a private door leading to the covered porch. Get rejuvenated in the luxurious master bath with his-and-her sinks, a make-up counter, soaking tub and large shower. The upstairs bedrooms are light and airy, with ceiling fans, neutral carpeting and plenty of closet space. A gigantic bonus room, also on the second level, features a kitchen area with a sink, mini-refrigerator and cabinetry, with plenty of space for watching television or playing a game of pool.